Clams are found year-round in various forms, including fresh (both shucked and unshucked), frozen, and canned. They are best in cold-weather months, as they are susceptible to bacteria in the summer months, but they are much easier to dig in summer. Thus they are usually less expensive during warm weather season. Whether shucked or unshucked, clams are highly perishable and should be eaten and or cooked as soon as possible. Shucked clams should be plump, smell fresh, and feel heavy for their size. Avoid those with the odor of ammonia. The clam juice should be clear with no shell fragments. Geoducks, if you can find them in the market, should have short, fat, unwrinkled necks. Wrinkling indicates they have been out of the water too long and are beginning to dehydrate. The flesh of clams can range from creamy white to gray to dark orange. Properly-handled fresh live clams will last 2 days in the refrigerator under optimum conditions. Whole clams still in the shell must be sold live. 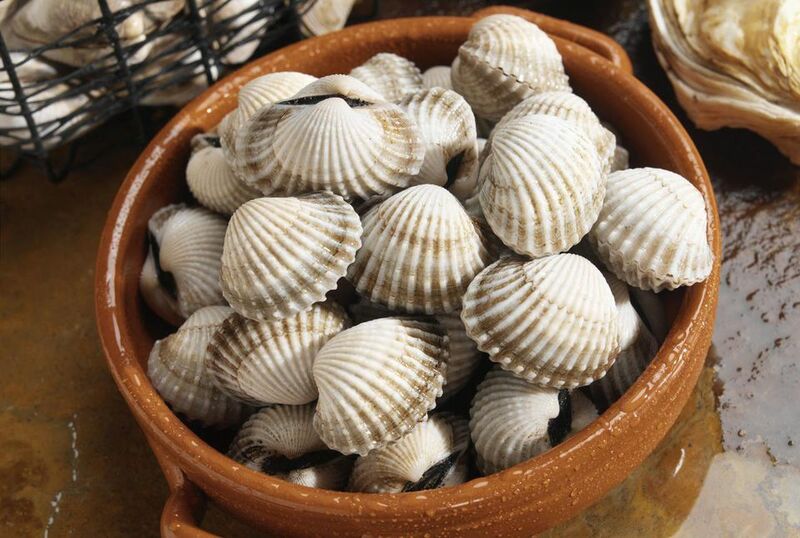 Fresh, unshucked clams should be stored in a porous bag made of burlap or other natural material in the refrigerator. If you have no cloth bags, store in a bowl covered with a wet cloth in the refrigerator, not on ice. Never store them in sealed plastic or submerged in water -- they will die from lack of oxygen. Use fresh clams preferably within 24 hours, although if they are truly fresh, they will last a few days under refrigeration. Discard any fresh, live clams with shells that are open or those that do not close when tapped, along with any that have broken shells. If you can jiggle the shell halves from side to side, it is a sure clue the clam is no longer living. For live soft-shell clams and geoducks, touch the siphon neck. If it moves, it is alive; if not, discard it. You can place the clams in a pot of water as another test, and discard any that float. Do not freeze clams in their shells. To freeze clams, shuck them, being careful to save their liquid. Rinse with salt water (1 tablespoon of salt to 1 quart of water), and place in a container with the reserved clam liquid and additional salt water so they are completely covered. Frozen clams will last up to 3 months at 0 degrees F. Thaw frozen clams in the refrigerator before using and never refreeze them. Cooked clams can be stored in a covered container in the refrigerator up to 4 days. Freezing is not recommended for cooked clams as they will become extremely tough and rubbery. Did You Know There Are over 4,000 Varieties of Crab? What Is Copper River Salmon?